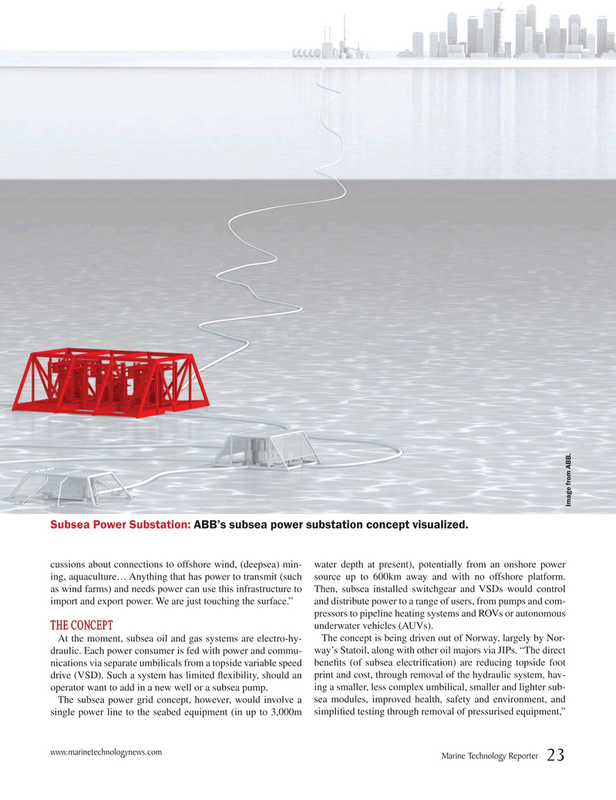 Subsea Power Substation: ABB’s subsea power substation concept visualized. cussions about connections to offshore wind, (deepsea) min- water depth at present), potentially from an onshore power ing, aquaculture… Anything that has power to transmit (such source up to 600km away and with no offshore platform. as wind farms) and needs power can use this infrastructure to Then, subsea installed switchgear and VSDs would control import and export power. We are just touching the surface.” and distribute power to a range of users, from pumps and com- pressors to pipeline heating systems and ROVs or autonomous underwater vehicles (AUVs).